A list of the 5 best iOS video editing apps for free to create some eye-catching videos on your iPhone or iPad. Although the video editing is a rather complex matter in its most professional side, the App Store has many interesting tools to create visual pieces truly amazing from the iPhone and iPad devices. Here we list the top 5 iPhone Video Editor app, which will allow you to create movies from your video clips, giving you the ability to do all sorts of cool things with your videos on iPhone. Grab the following 5 Best iPhone Video Editor App available to download for free on appstore. 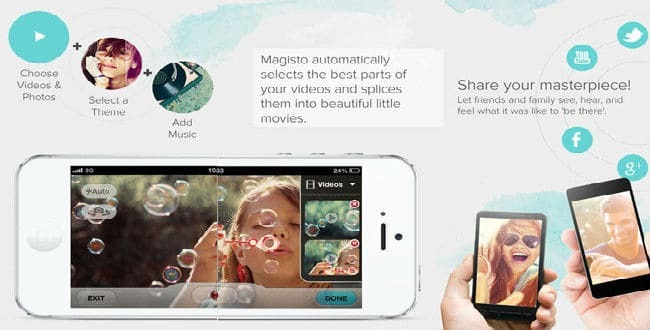 Magisto is a good iOS video editing tool that can customize your recordings with basic settings quickly and easily. All you have to do is simply select the photos, videos and soundtrack you want to include, select a theme for the video and the application will do the rest. The application also provides quick tools to publish your video on various social networks and have the option to link your Facebook, Twitter and YouTube profiles to synchronize updates. Create colorful film frame animation HD with lots of options anywhere instantly on your iPhone or iPad. Everything you need at your fingertips without the need of a computer. Also, allows you to use iMovie to add themes, titles and transitions directly from your device. Create fantastic movies with Stop Motion Studio iPhone app and enjoy sharing them with the world on Youtube, Facebook and company. The special effects in Hollywood in the palm of your hand. The app provides hundreds of special effects of all types to add on your videos and turn them into amazing and spectacular ‘creative pieces made in Hollywood’. With Action Movie FX you can add effects like explosions, giant balls falling, wrecked cars, etc to your videos. 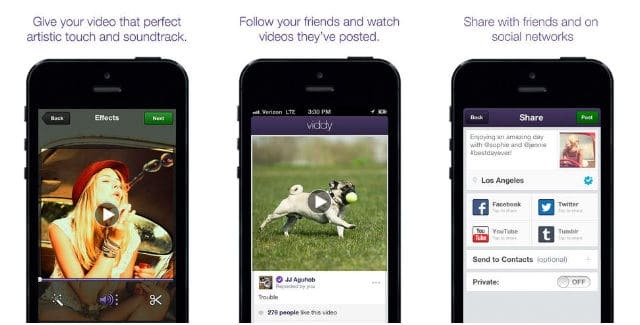 When finished you can share your videos with your friends on Facebook. Montaj is a free social video editing app that invites you to assemble simple but attractive videos. The idea that lies behind Montaj is making videos and sharing them. The clips have a maximum duration of 5 seconds, but you can gather as many as you want, add music and filters to give a unique touch to your videos and share them within MONTAJ or via Facebook/Twitter/Email. Viddy for iOS is a pretty basic video editing and sharing app, Viddy lets you “beautify” your video clips with custom filters and soundtracks. To work, this app lets you adjust the contrast, brightness, saturation, lighting and many more aspects. When you’re ready, share your videos with a one-tap function to Facebook, Twitter, Tumblr and YouTube. If you use some other app to edit videos on iPhone, iPad please do share them in the comments section below.